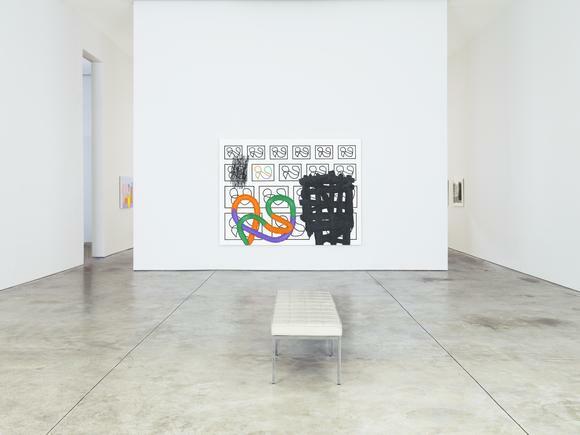 Cheim & Read is pleased to present an exhibition of recent work, including a series of black and white drawings, by Jonathan Lasker. Lasker’s previous show with the gallery, comprised of early work (1977–1985), was in 2012. The current exhibition will be accompanied by a catalogue with an essay by Raphael Rubinstein. Rubinstein also curated Cheim & Read’s 2013 show, “Reinventing Abstraction: New York Painting in the 1980s,” which included Lasker. Lasker’s newest work continues to explore the ways in which paintings are constructed and perceived. Employing three consistent components —figure, ground, and line—Lasker’s careful arrangement of abstracted elements challenges one’s usual reaction to non-representational painting, positioning the viewer in an unexpected discourse with form and space, foreground and background, objecthood and artifice. As Lasker describes, his paintings are meant to “make the viewer see him or herself in the act of viewing,” drawing attention to “how we construct a picture in our mind.” By positioning various forms and patterns— through repetition, segmentation, and layering—to visually recede or advance in pictorial space, Lasker composes illusionary “pictures” which are at once ambiguous and decisive. Recurring figural motifs repeat throughout the paintings, acting as a sort of abstract visual vocabulary. Paralleling linguistic concepts, Lasker uses these “signs” to set up various dialogues and spatial relationships which the viewer, as if following clues, is intended to decipher. Often, a thickly rendered motif is echoed by its separate, less tactile outline; the two forms reverberate together but seem to exist on different planes, much as the missing piece of a puzzle is mimicked by its empty shape. In other works, the prominent inclusion of Lasker’s signature or initials heightens the tension between illusion and reality: dimensionality is mocked by the stubborn literalness of the painting’s two-dimensional surface. One of Lasker’s new paintings, The Universal Frame of Reference (2014), is structured as a picture within a picture, in which Tetris-like forms and different densities of circular squiggles volley for position around a central, multi-layered image of vertical bars, an enigmatic “L”-shape, and three-dimensional slabs of woven, primary-colored paint. Space is contradictory and ambivalent, flat and deep, agitated and still. The paradoxes in Lasker’s work originate in the source of his compositions, which are conceived in loose, impromptu drawings. From these sketches, Lasker chooses “images” that he further works as small-scale studies for color and composition; finished “maquettes” are then used as guides for his large-scale paintings, much as a traditional European painter might have prepared his work centuries ago. Lasker outlines some of the elements on canvas, while others are painted directly. He works in stages, using tools and techniques appropriate to the effects he strives to achieve. For example, a hard-edged sponge brush can mimic the cool, sharp line of a magic marker, while woven cords of color are enlarged to thick, overlapping swaths of pigment (Lasker calls them “things of paint”). Lasker’s rigorous pre-planning, including the proportional translation from sketch to canvas, takes time. His restless, subconscious doodling is reinterpreted at a different scale, and then improvised and reoriented to accommodate a contemplative, methodical layering of paint. Passages of thin, almost transparent squiggles are fully dry before the thick, wet-on-wet figures are introduced. In his drawings, toothy lines of graphite are contrasted with deep black fields of India ink. Though a sense of time is manifested in the different ways and speeds with which Lasker applies paint, it is the interplay between the spontaneous and the consciously rendered that is thematically crucial to his work: through his process, his subconscious becomes conscious, his intuitive gesture stilled. Space is provided for the viewer’s own interpretations, and ultimately, questions: how and why do we identify forms in space, or discern landscapes in horizontal lines? Why does the human psyche yearn to find itself reflected in a non-representational field? How does the visual beat of paintings correlate to our own dimensional chronology? Lasker was born in Jersey City, New Jersey, in 1948. Lasker has had recent exhibitions in France, Norway, Sweden, and London. His work is in the collections of the Museum of Modern Art, New York; the Los Angeles Museum of Contemporary Art, California; The Broad Art Foundation, Santa Monica; Fundacio La Caixa, Barcelona; the Whitney Museum of American Art, New York; Musée National d’Art Moderne, Centre Pompidou, Paris; and Moderna Museet, Stockholm, among others. Lasker lives and works in New York City, and is represented by Cheim & Read.